The Marian Consort is back with the first disc dedicated to a "disciple of Josquin," the mysterious Frenchman Jean Maillard, focusing on his Mass "Je suis déshéritée." Who better, then, than Rory McCleery’s Marian Consort to give this composer’s rich and varied output its first dedicated recording? Their characteristically precise and yet impassioned performances bring out both the network of influence in which Maillard’s music participated – its Josquin-esque pedigree, and influence on successors including Lassus and Palestrina – and its striking, individual beauty. Even early-music specialists don't know much about Jean Maillard, who was probably born around 1515 and died in the early 1570s, and was regarded (along with better-known contemporaries like Janequin and Richafort) as a disciple of Josquin. He may or not have lived in Paris, and could have been employed at the royal court, but he was famous enough to be mentioned by Rabelais in Gargantua and Pantagruel, and his music became profoundly influential. Later composers like Lassus and Palestrina used Maillard as a model, and copies of his works circulated widely around Europe. This collection by Rory McCleery's Marian Consort, though, is the first disc devoted entirely to his music; the sequence centres on one of six surviving masses, based upon the chanson Je Suis Déshéritée. 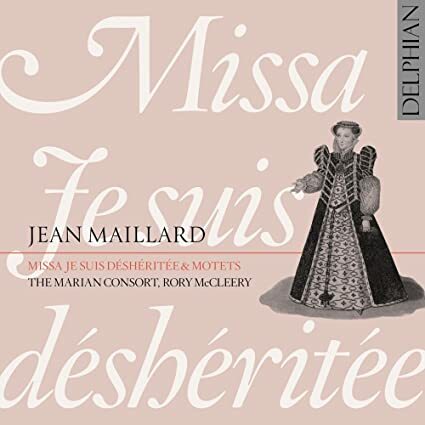 It's a concise mid-16th-century parody mass, and the motets that the Marian Consort interleaves with its movements, with their vivid pictorial touches and their imaginative use of plainchant melodies, give a better sense of why Maillard was so widely admired. The performances are models of discretion and musical taste, every texture clear, every phrase beautifully shaped.